Hello friends! I’ve had a very productive weekend – lots of play time in my craft corner stamping and die cutting and making all sorts of cards. 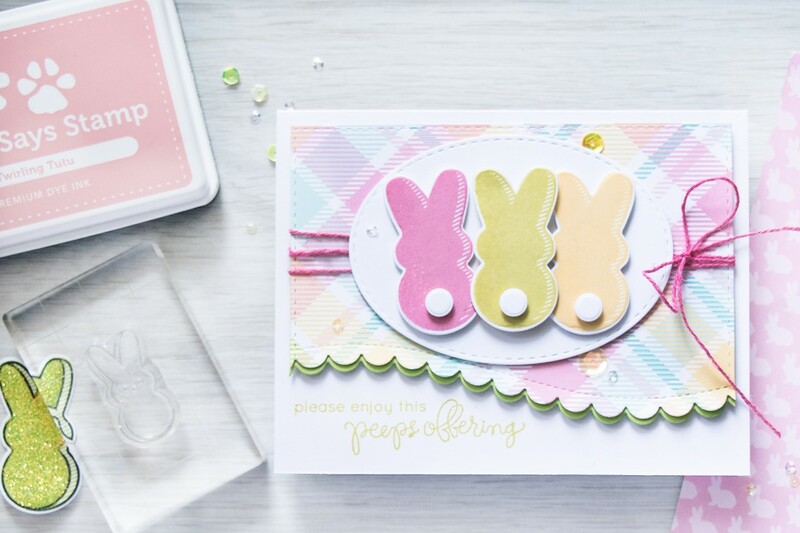 I’ve been having so much fun with the March 2016 Card Kit from Simon! I shared a card and video the other day and have also been playing with various glitters since glittering my peeps. 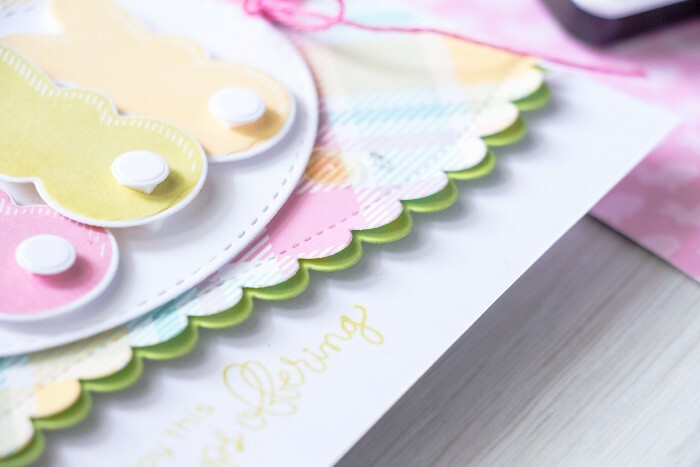 I wanted to make a simpler and cleaner card this time so I started by die cut a rectangle using Simon’s Stitched Rectangle die and cut it out of beautiful pastel plaid pattern paper from the kit. Next I used Wavy Scallop Stitches die (the one with the largest scallops), trimmed my rectangle and created beautiful faux stitching and scallops. I also die cut additional scallop border out of Simon’s Green Apple cardstock and layered it under the plaid one. I lifted up the scallops on both borders, love doing that. I stamped and die cut 3 peeps using Simon’s Duckling, Twirling Tutu and Catkin inks, I also gave each of my bunnies a little tail by die cutting a circle out of white cardstock and foam mounting it. 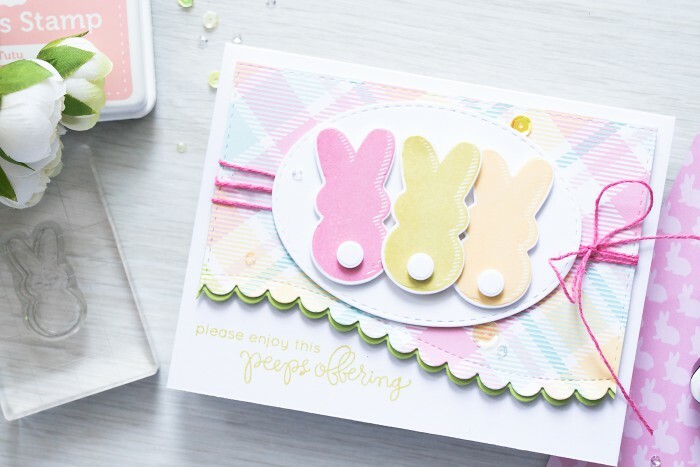 Peeps were arranged on a die cut stitched oval and were foam mounted onto my plaid background. 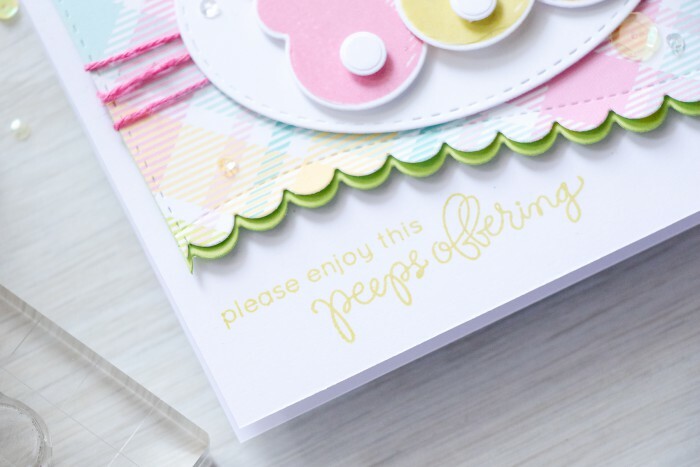 Trimming off a part of the base panel gave me enough space on the card base to stamp a sentiment – Please enjoy this peeps offering, I stamped it using Catkin to match one of the stamped peeps. I added a few sequins from the sequin mix included in the kit and that finished my card for today. Very cute card! I like the plaid and the bunnies! So adorable!!! These tails!!! Very beautiful and sweet card! I know 😀 the minute I die cut the tails I was so in love with them! thank you! Very cute. 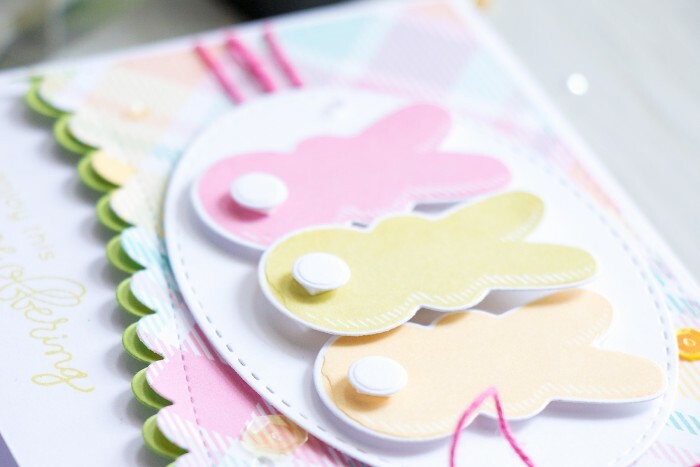 Love those bunnies and the design of your card. Thank you for the card. Love the border.